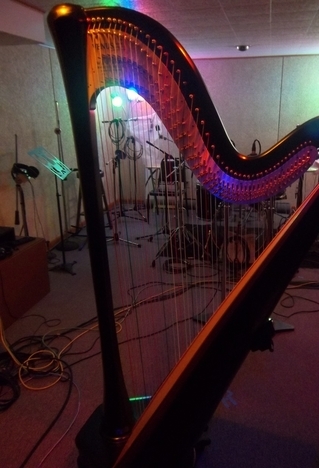 If you would like to have harp music for your wedding ceremony, but scheduling, location, or budget constraints to not allow it, consider a custom harp recording! I work with couples to create a play-list for their ceremonies that includes the music for their processional, mid-ceremony interlude, and recessional. All pieces are timed to the length you request, so you can use the recording for any size wedding party and for any length of aisle. All custom recordings include three pieces of your choice, with the option to add other selections. Each piece will be lengthened or shortened to meet your timing requirements (I suggest that you visit your venue and actually walk the aisle to know how long the processional is likely to take). Additional songs $50 each. Fifteen-minute "harp prelude" and "harp postlude" recordings (non-customized) can be added for $50 each. Please inquire for pricing for duets, trios, and larger ensembles. These recordings also serve as wonderful keepsakes for couples who hire me to play live at their weddings! Email me for more information or to begin working on your wedding music!